Are you a stepmom dealing with a high-conflict ex-wife? 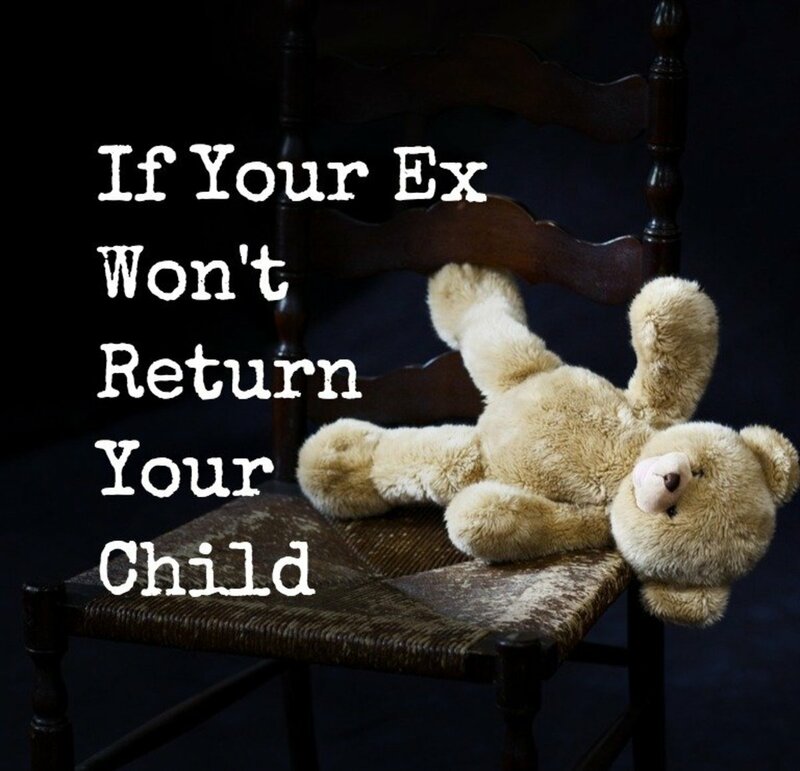 Does the ex frequently use the children as weapons by withholding visitation? Does the following scenario sound familiar? The court order clearly states your husband is to have his children for the weekend beginning at 5:00 PM on Friday. The exchange location is her house. The ex-wife has sent a myriad of emails, texts, and even a voicemail or two demanding to know every detail of the upcoming weekend. In each message the ex threatened to keep the children, basically forever, if your husband did not comply to her demands. Have you been there before? This type of ex-wife does not care what the parenting plan says. She wants control of the situation and she wants it now! Read on for some practical advice on how to deal with this type of situation. 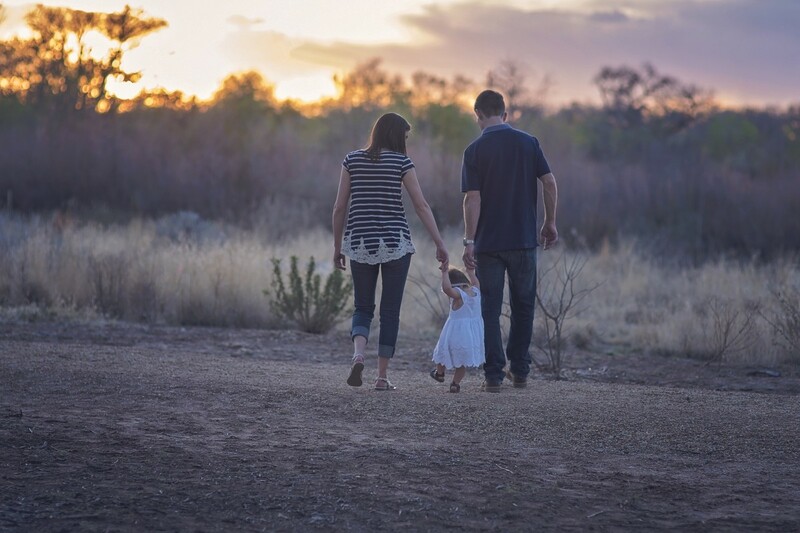 When parents divorce, legal and physical custody, as well as parenting time with each parent, is established in the final parenting plan. Many divorced parents have some issues and disagreements during the divorce proceedings and soon after the divorce is final. These issues are typically resolved once the emotions from the separation and divorce are not running so high and a new normal has been established. Unfortunately, there is a subset of women who never move beyond the divorce and who are hell bent on revenge and destruction, even if that means destroying their children during their campaign of rage. These are the women who hate their ex-husband more than they love their children. 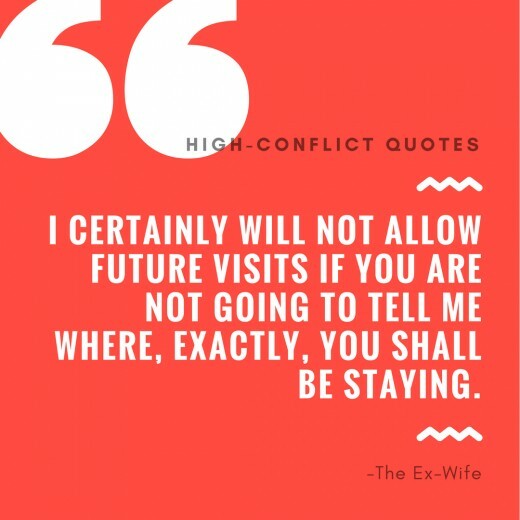 If it's been more than a year after a divorce is final and the ex-wife in your life is still a vortex of hostility and loathing then you likely have a high conflict ex-wife on your hands. Never fear! There are actually many stepmoms in your shoes and we have lived through it enough to offer some practical tips for how to deal with such an ex-wife. High conflict ex-wives can continue the conflict for decades depending on the age of the children at the time of the divorce. Many times these women have some type of personality disorder though it has often not been diagnosed by a professional. Their weapon of choice? The children. Their method of torture? Destroying the relationship between the children and their father (and any future or current stepmom and/or siblings that come along if the father dares to move on from her). I am both the child of a high conflict ex-wife (my mom) and the stepmom in a situation with a high conflict ex-wife. Between the two situations I have nearly 30 years of experience of either being the weapon of choice or watching my stepchildren being used as a weapon. Here is what I have learned over the years. The first task to accomplish when the ex-wife is withholding parenting time is to establish a very specific parenting plan. Unfortunately, a high conflict ex-wife does not care what the parenting plan actually says but that is still what has to be done first. I've personally witnessed the ex-wife I deal with screaming: "I don't need a f**king court order to tell me how to parent." These, however, are precisely the kind of women who do need a court order to be an appropriate parent. 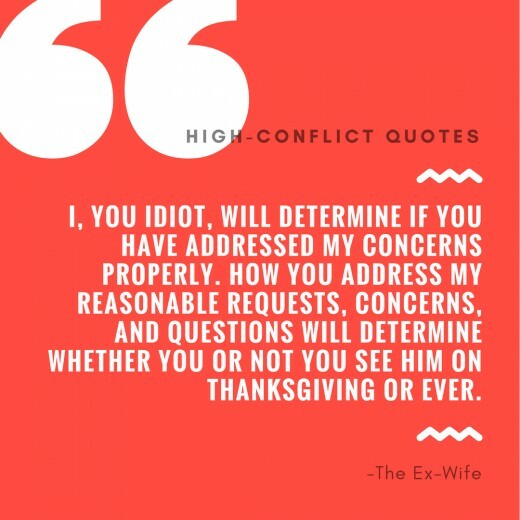 High conflict ex's are experts at ignoring sections of the court order they do not like or making up outlandish interpretations of various sections to ensure they are the only ones who benefit. The most continuous part of the parenting plan for these women is parenting time with Dad. Even when parenting time is clearly outlined (ex: The father's parenting time begins at the release of school on Friday or 3:00 PM, whichever is earlier, and continues until school resumes on Monday or 8:00 AM, whichever is later) these types of women will refuse to agree to let the children see their father and will invent a myriad of reasons why. Usually these women will send a list of rather creative written or verbal demands that are not outlined or referenced in the parenting plan in any way. These mothers will demand to know every detail of the child's time with the father before she will "allow" it to happen. Or, these women may demand to know every single person the children might possibly encounter over the weekend, especially if a new wife/stepmom is now in the home. A favorite claim of high conflict ex-wives is that they alone have the power to either grant or deny visitation simply because they are "the mother." No other explanation or reason for withholding the children is offered. Once a very specific parenting plan is in place, the second task is to begin to document each and every missed visit by calling the local police. If you live in most states in the US, the police, sadly, will not force the ex-wife to hand over the children in the moment. Instead, the police will say that custody is a civil matter and that it must be taken to the courts. Every state, however, has a process to follow to file a complaint with the court over missed parenting time. Most of the time the forms are user friendly and can easily be filed without a lawyer. You can find the forms by searching for the court system in your county. If you live outside of the United States your courts will have a different procedure. In order to document a missed visit through the police, the father has to show up to the exchange location at the time set forth in the parenting plan. This is why a specific exchange location, in addition to a specific exchange time, in the parenting plan is very important. Threatening to withhold the children does not equal an actual denied visit in the eyes of the courts. If the ex-wife says she is definitely going to withhold the children, even if it is in writing, the father must still actively attempt to go to the exchange location to exercise his parenting time for it to count as a missed visit. Once the police have documented that the ex-wife is not going to let the children come, the father must ask for a police report and must go and obtain a copy of this report to file along with the motion for denied parenting time. This must be done each and every time the ex-wife does not hand over the children. If a father chooses to look the other way or not file a motion to "keep the peace" he is condoning the behavior by the ex-wife. Remember: The children have a right to have a relationship with both parents. Parenting time is the right of the children, not the right of the father. Fathers must understand when they do not take action for missed parenting time they are denying the basic rights of their children. In most counties in the United States, fathers must be prepared to to file many motions for the mother withholding parenting time before any action will be taken by the court. This is a distance race, not a sprint. Be prepared to watch the mother get away with this countless times before anything might happen to her. I know more than one father and stepmother who ended up with sole legal and physical custody after a few years of always taking it back to court. It must be done every single time. Have you had to call the police during a custody exchange? The final task is to maintain one's sanity, inner zen, and determination in the face of extreme adversity. 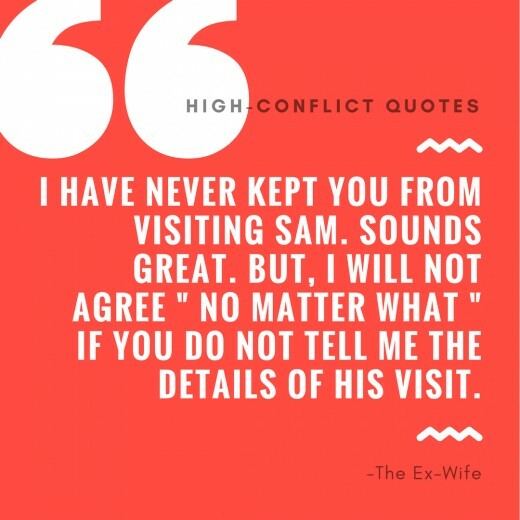 High conflict ex-wives are known to wage a war for decades through mental and emotional abuse of the children as well as the father of her children. High conflict ex-wives, especially those who may have a personality disorder, can use many forms of abuse on both the father of the children as well as the children themselves. Gaslighting is one of the most common forms of abuse used in high-conflict custody situations. The term gaslighting was coined after the British play "Gas Light" which was later made into a movie by the same name. Gaslighting is a form of emotional and mental abuse in which the abuser manipulates the situation repeatedly to trick the victim into distrusting their own memories, thoughts, and actions. Prolonged gaslighting makes the victim unsure of anything and willing to believe anything the abuser says. In other words, the abuser will do something awful over and over again and then claim they have never done such a thing. Many men who have children with high conflict ex-wives experience nearly constant gaslighting from these women. For this reason, it is imperative to only communicate about parenting time with the ex-wife in writing. Text messages or emails may not be admissible in court (and be sure that if the ex-wife is truly high conflict there will be many court battles!). For this reason I recommend using a program like Our Family Wizard that is admissible in all court proceedings. It will be the best $99 you have ever spent. They also offer free accounts for those who demonstrate financial need. If there is absolutely no way to avoid a phone call then the phone call should be recorded and transcribed. Several apps are available for use on smartphones or a regular digital recorder will work by using speaker phone. Be sure to check the recording laws in your state prior to recording the ex-wife so you don't get charged for doing something illegal. Both the verbal documentation and written documentation of the phone call should be documented. 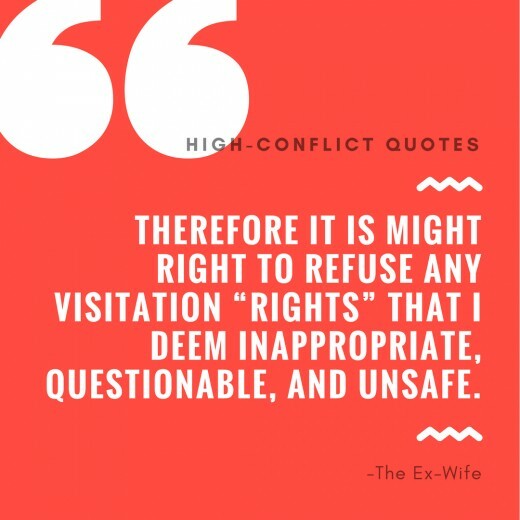 It is very typical for high conflict ex-wives to repeatedly say they have the right to deny parenting time and to follow through with that threat. When it is time to go to court, however, these very same women will deny they have ever said such a thing. Documentation serves two purposes. 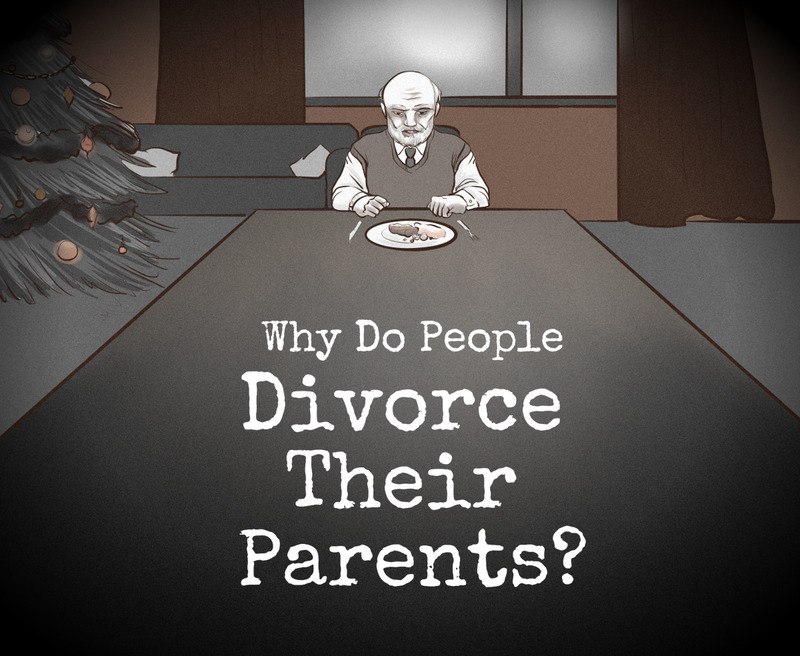 First, it shows a patters of unwillingness to let the children have a relationship with both parents. I have known more than one mother to lose custody when a father meticulously documents this type of pattern. Second, it eliminates the ability of the ex-wife to "gaslight" and further mentally abuse the father (on this particular topic anyway). 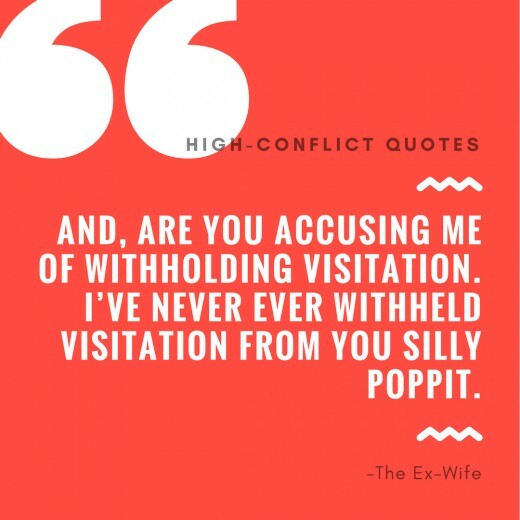 Does the ex-wife in your life try to gaslight about withholding visitation? My husband ex wife will not allow me (step mom for 7 years) to pick up his daugther at her house while he is out of town on the day he returns home. Does she have the right to do this? She allows my husbands mother to pick her up daugther but not me. We have 3 other children as well that this affects. We haven’t been “allowed” to see my husbands son in over 1 year due to the ex. The last time he visited my husband and I both were accused (by the ex) of abusing his son. Also my minor daughter from a previous Union was accused also. I also filed a harassment suit against her last year. Since all of this my husband is barely allowed any phone contact either. Any advice would be helpful on what we can do to try and resolve this issue. Thanks in advance. You do actually have to show up to the exchange location to count it as a missed visit. You would need to call the local police and have a copy of your court order with you so they can document the missed visit. Then you would have to file a contempt motion in the jurisdiction of the parenting plan, which is usually where the kids live. Sorry you are going through this. I have also lived through long distance exchanges and it's awful! I have a high conflict ex wife and we have joint physical and joint legal custody. We live in separate states about a 6 hour drive one way. We are supposed to meet in the middle for exchanges at a specific location, but she refuses to meet me for exchanges. I have a few questions on reporting the withholding of visitaion: 1. if we live in separate states and the exchange location would be a 6 hour drive for me to go there and back, do i still have to go to the location when she texts me explicitly no she isn't going to bring them to exchange? For example, i say i will be at the location for exchange at our designated time and her reply is that she will not be bringing them and i can't see them even if i drive all the way to her house (12 hr trip total on friday then a 12hr trip total on sunday to take the kids back). 2. Where do i actually file the police report? The county our custody case is in, the county she actually lives in now, the county i live in, or the county where we are supposed to exchange? I hope you can help with these questions. I didn't know anything about having to document the missed visits other than using text messages so your article has given me a direction to start in. Thank you! I admit I didn't think lightening could strike like that twice. :) And though I knew she was "difficult" before we got married nothing prepared me for exactly how far she would go. It's beyond all rationale behavior and has been for 10 years. On the plus side I have been a safe person for my SS to discuss what he goes through because he knows I have been there too. But yes, if I had it to do over again I would pick one of the 7 billion people without a crazy ex-wife. "I am both the child of a high conflict ex-wife (my mom) and the stepmom in a situation with a high conflict ex-wife." There's some irony you chose a man who was in the same position of your father. Maybe on some level you believe you can be of help this time around. 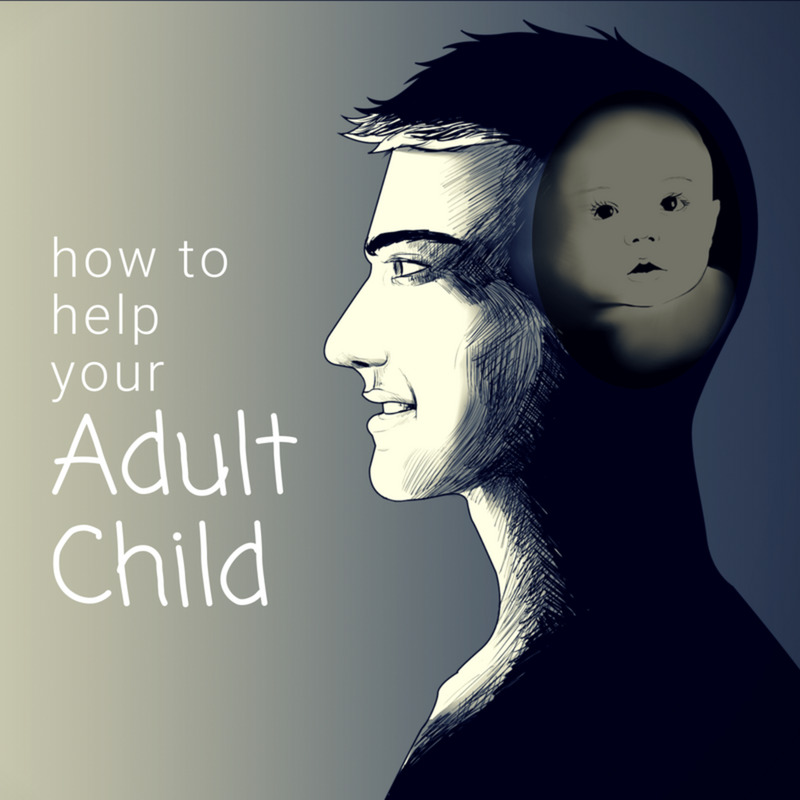 People are either drawn towards or they avoid their childhood experiences. People often overlook the impact someone's ex might have on their life if they marry him or her. This is especially true if they have children together. In a world with over 7 Billion other people I would choose to be with someone who doesn't have the "crazy ex" as part of their baggage. It's not a surprise that many men in this position simply pay their child support and keep their distance.